Los Angeles Times / CALENDAR / SUNDAY, MARCH 4. 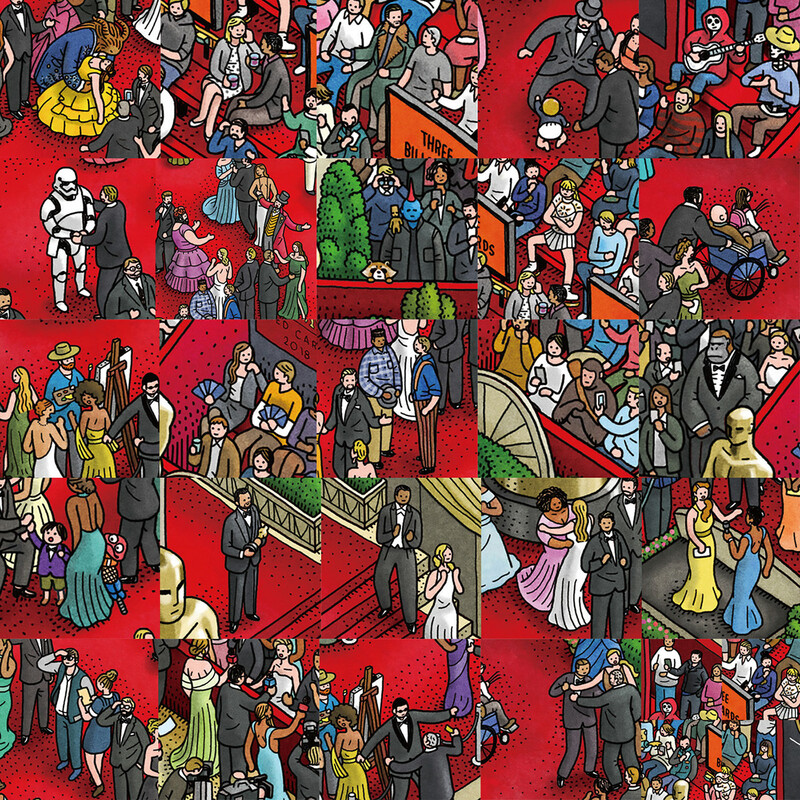 2018.
an eye out for depictions of the nominees for best picture and a few other big movies as well. The idea is... 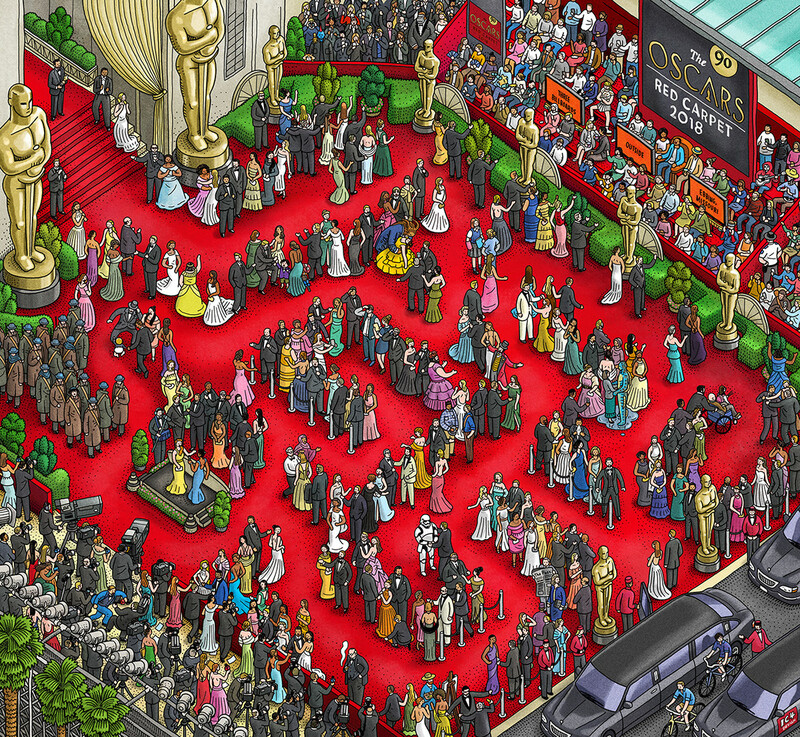 It is difficult to guess who will take Oscar = Like a difficult maze on a red carpet. So They want detailed maze illustration in our style. 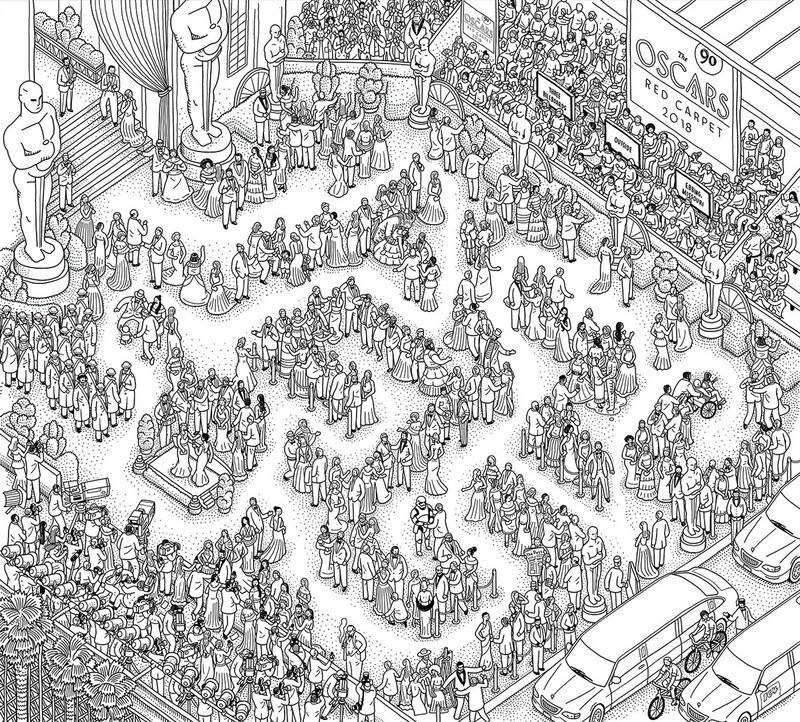 At first, we thought of making a maze shaped like “90” as this year is the 90th Oscars (see thumbnail). We rejected this idea ourselves. However, this “90” idea was thought about again and again, even after the project was finished! In any case, we wanted to make a more complicated maze shape and so we tried to remake it over and over again. Bearing in mind the hard conditions (mainly, our tight schedule), our first idea was to include the nominees in a simple picture, using only one color. We then started to think more about what we could do to entertain the viewers on this day in the morning of the Academy Awards. We thought hard about the readership of the paper. Not only movie officials in Hollywood but also movie fans would likely be glad if they could find pieces they cared about. Also, this ceremony would be watched with keen interest in relation to diversity (race/gender/sexuality), minorities, immigration, sexual harassment and power harassment etc. We wondered how much real life we could include in our drawings. We didn’t want it to become too serious, but, likewise, didn’t want to dodge serious issues. We also considered the terrible tragedy of a shooting at a high school in Florida during the paper’s production. Should we change the pictures of characters depicted with guns? We are Japanese from Hiroshima, Japan and, as such, worried that there may be many things that we didn’t understand? Also, in Japan, many of these movies had not been released yet. We were worried about these kinds of things during the time-pressured design phase. We worried that our understanding of such complex issues may not be enough for this job. 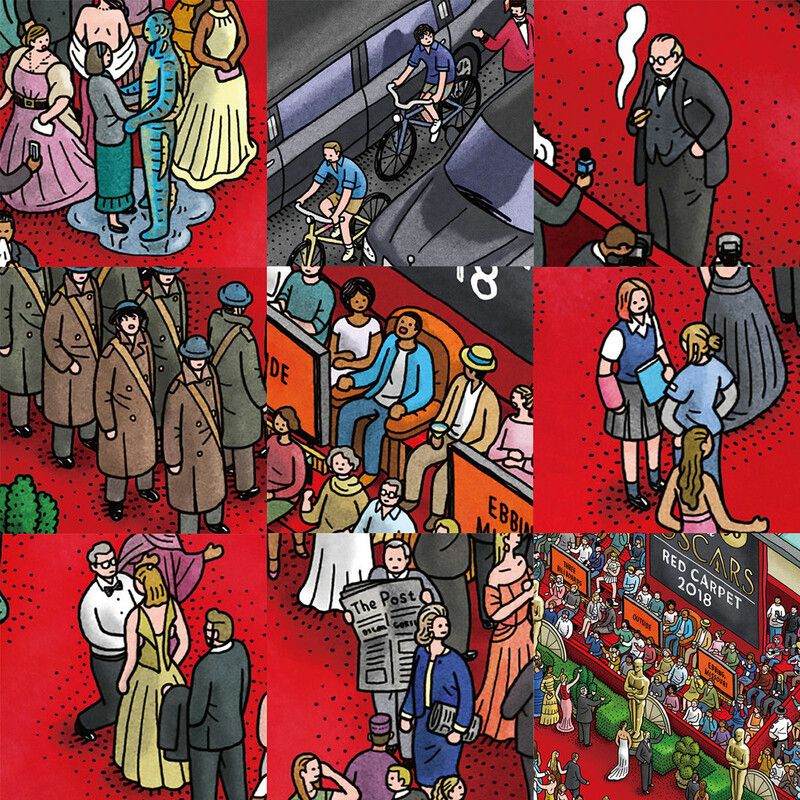 In the end, we included more nominees using full-color, and with various scenes in the style of our usual work. We wanted to entertain those at the ceremony, keeping them occupied while waiting for the awards, during the ceremony and even after the awards. We hope it succeeded! The best picture nominees are below. But it Also includes nominees from other categories. "BEAUTY AND THE BEAST", "THE BIG SICK", "BLADE RUNNER 2049", "THE BOSS BABY", "COCO", "STAR WARS: THE LAST JEDI", "THE GREATEST SHOWMAN", "GUARDIANS OF THE GALAXY VOL. 2", "I,TONYA", "LOGAN", "LOVING VINCENT", "MOLLY'S GAME", "MUDBOUND", "WAR FOR THE PLANET OF THE APES", "KONG: SKULL ISLAND", "LOU", "BABY DRIVER". On the red carpet at the Oscars. 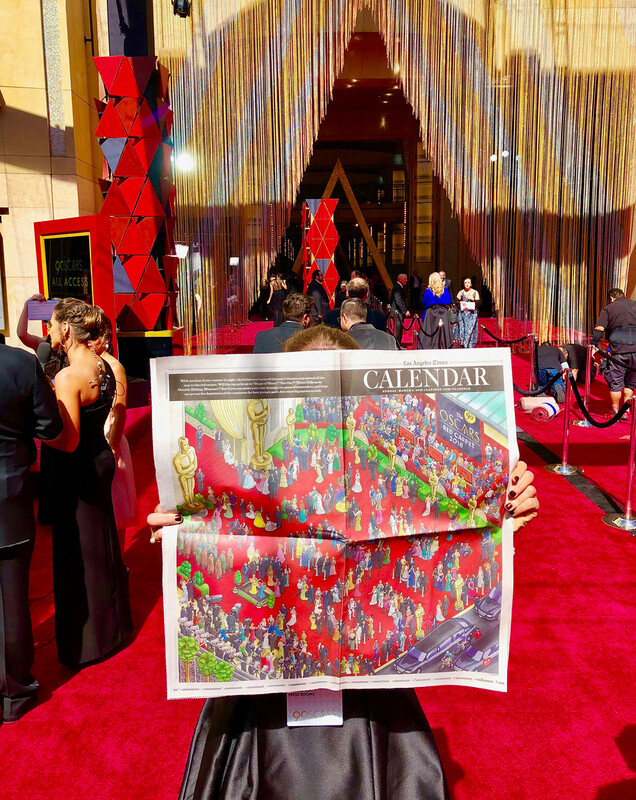 90TH OSCARS L.A.Times. 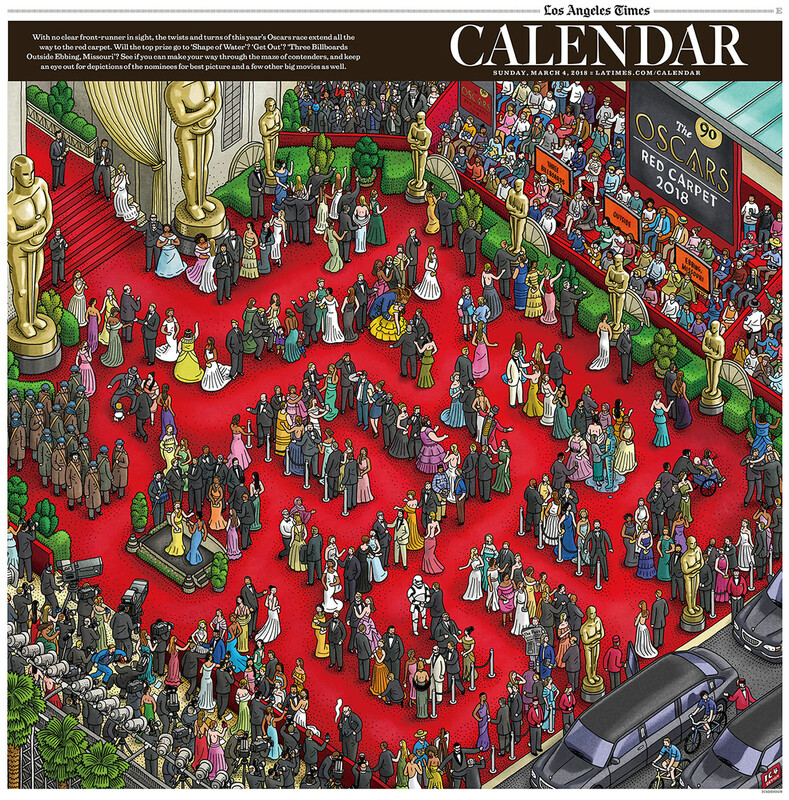 Los Angeles Times Sunday Calendar wraparound cover Maze illustration.